Skin Remedies For Psoriasis, Eczema, Dry Scalp And More. Did you know that as much as 85% of people today are searching for skin remedies for problems such as psoriasis, eczema as well as other skin or scalp conditions. There are over 3000 medical terms for the various skin issues that exist and these problems are more prevalent now than ever! In this informative website you will find such topics as: natural remedies for eczema in adults, how to care for baby eczema naturally, skin remedies for dry scalp, seborrheic dermatitis skin care and natural remedies for psoriasis of the scalp. Let me introduce myself. My name is Nanette and I am a Certified Master Herbalist who has studied health for many years. People come to me with just about every skin problem known to man. They've shared with me how frustrating it can be trying 10's and even 100's of commercial products (each promising fast and effective relief) and making countless trips to the dermatologist and still getting no results. Believe me, what you don't know CAN HURT YOU! First know that the skin is an amazing organ. The skin renews itself every 28 days! The average person has about 300 million skin cells. 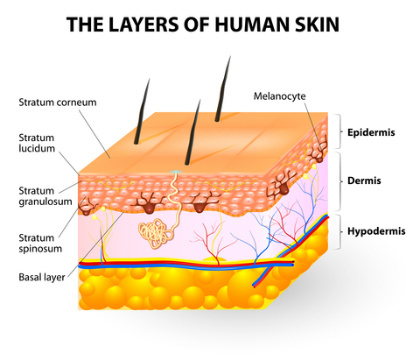 A single square inch of skin has approximately 19 million cells and up to 300 sweat glands. Your skin constantly sheds dead cells, about 30,000 to 40,000 cells every minute. That's nearly 9 pounds per year! This amazing skin has a natural acid mantle that has a particular level of acidity characterized by pH from about 4.5 to 6.0. 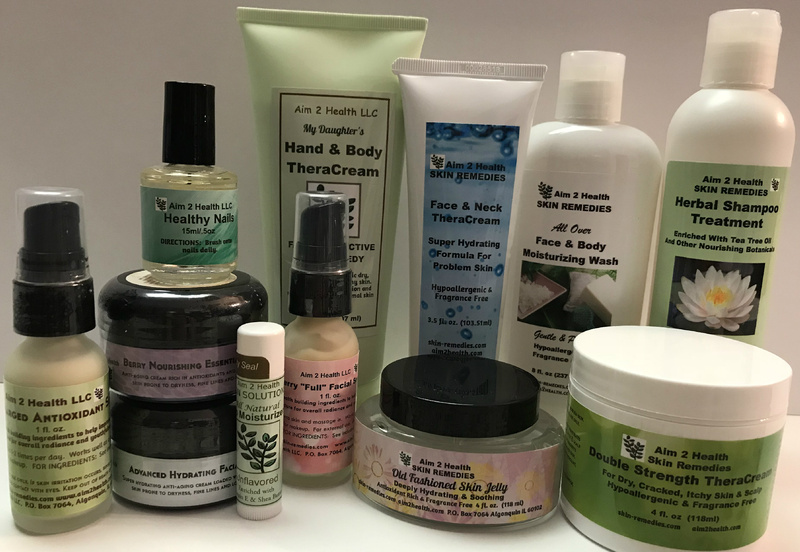 People ask me why I think there seems to be an epidemic of unresolved skin disorders such as psoriasis, eczema, dermatitis, dry itchy scalp etc. We slather and rub them in and never think twice about the chemicals in our products. 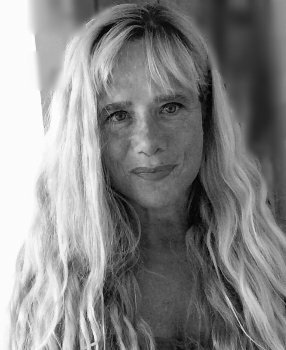 Fast food industry, packaged grocery meals, environmental pollution and the hidden chemicals, toxic agents, carcinogens and unpronounceable ingredients in the lotions, creams and shampoos, have turned up in our bodies but the health effects of regular long-term exposure, even to small amounts, are still unknown. Most people experiencing skin conditions have previously had years of using chemical laden creams, lotions and shampoos. They have suffered with skin issues that then occurred from the chemicals that ended up in their systems and began the long cycle of seeing dermatologists with no long lasting results. Many hydrocortisone and steroid prescriptions each year are given to those afflicted with skin conditions that are harsh and have side effects ranging from weakened immune system, thinning skin with a susceptibility to bruising as well as permanently dilating certain blood vessels. From infants to our seniors, drugs and harsh salves and creams are being used. What Makes A Product Work? It is important to ask yourself what makes any product work? Is it so surprising and hard to believe that synthetic ingredients, drugs, steroids and other harsh chemicals that FORCE your body to produce a certain response, often fail due to the body's built in "PROTECTION FACTOR"? Just as healthy, live foods nurture the body, natural and plant based remedies help your skin to respond in the way you want it to. But I am seeing more and more of these people make their way towards natural remedies for skin and scalp therapy that is pure and organic and works fast and to this end I am thankful. I believe in thoroughly educating those who are truly searching for "nature's way" of helping the skin and scalp to repair and that's why I offer an extensive amount of information for my viewers. It is in this knowledge that people can make an educated choice about their health care and start making more natural and safer choices that will actually yield healthful results. This is what I and my company are all about, this is our mission, this is our passion. I have since seen 1000's of people with severe skin and scalp problems get the help they so badly needed in my recommending natural skin remedies. Plain and simple......THEY WORK! I encourage you to explore this highly informative site to gain a greater understanding in the care and treatment of the myriad of existing skin problems. Write me with any questions or concerns you may have and I will respond as soon as possible.....skin problems are no waiting matter! Dry skin can appear on anyone with symptoms of itching and flaking! Learn how dry skin conditions are responding to natural skin remedies that are fast and safe for your entire family. Relief from itchy skin does NOT have to take years! Learn how itchy skin conditions are responding to natural skin remedies that are fast and safe for your entire family. Dry scalp brings flaking, itchiness and never ending frustrations. With the proper understanding and care, dry scalp can be relieved and corrected. Natural products work with your skin. Use a body wash that is natural and gentle enough for all over use. Most soaps actually dry out the skin and cause or worsen skin conditions with the harmful chemicals in them. Be good to your skin! Dry Face Skin Symptoms And Remedy. Dry Feet Hurt! Take Care Of Problematic Foot Skin. The face wash you use is just as important as the skin cream you apply. Most face washes are nothing more than detergents that hurt your skin. You need the right ingredients for healthy skin. If you or a loved one is experiencing hair loss, get help NOW. Hair loss can be stopped and does NOT have to be permanent. Facing the world with rosacea can be devasting. Join the 1000's of rosacea sufferers who are getting the fast relief they need to look and feel their best. When baby develops diaper rash, you need to treat it fast. This is your no. 1 source for the best natural cream that relieves diaper rash and keeps baby's skin healthy. Stretch marks can be prevented such as during pregnancy or rapid weight gain. Stretch marks that are already present can be greatly minimized with the proper care. Dandruff is a very uncomfortable condition especially when we need to face the world everyday. Get the relief you need for dandruff and the flaky, itchy symptoms that accompany it. When you have diabetes, you can quickly develop what is known as diabetes foot. Learn how to care for this challenging condition. It can happen so quickly -SUNBURN! Learn how to prevent and care for sunburn when it happens to you or a family member. Quick healing of the sun damaged skin is essential to prevent down time. Get help now for impetigo! Care for this condition fast and effectively and learn how to prevent impetigo with natural products that provide rapid relief and antibacterial protection. Our Green PowerHouse "Plus" contains over 35 ingredients, including fruits, vegetables, probiotics, digestive enzymes, fiber and herbs. Got pain, constipation, psoriasis? Then colon cleansing is critically important for you to be symptom free. Learn how the entire body responds to colon cleansing. Read amazing testimonials from our customers who found relief from psoriasis, eczema, dermatitis, dry scalp and more! Find the right skin remedies for your skin and scalp problems now. Learn how specific natural ingredients are providing powerful relief for psoriasis, eczema, dermatitis, dry scalp and more! Skin repair begins 7 layers deep. To truly relieve conditions of psoriasis, eczema and dry scalp you need natural remedies that can penetrate the skin's layers. Contact us for advice on natural skin care remedies to problem skin and scalp. Learn how to properly care for your skin needs. 1) Remember! The body will absolutely RESPOND to natural, so why settle on chemicals and synthetic ingredients. 2) Become "label readers" as this is vitally important. What you "don't know" can and will hurt you. 3) You are not alone....85% of the population is searching for skin solutions! 4) Your lifestyle plays an important role in your health and external appearance...think about what you eat, drink and do and don't do! 5) The body works as a whole unit.....when one area is problematic, look at the bigger picture. 6) The human body is the most perfect machinery ever made! It only improves with use! 7) Take charge of your life and health......after all, it belongs to YOU! 8) Good health is earned! Anything worthwhile is worth your time and effort. 9) It's the little things you do everyday of your life that pave out the road in your journey in life......will it be rocky or smooth? YOU choose! Choose wisely and be good to yourself and to those who care for you.